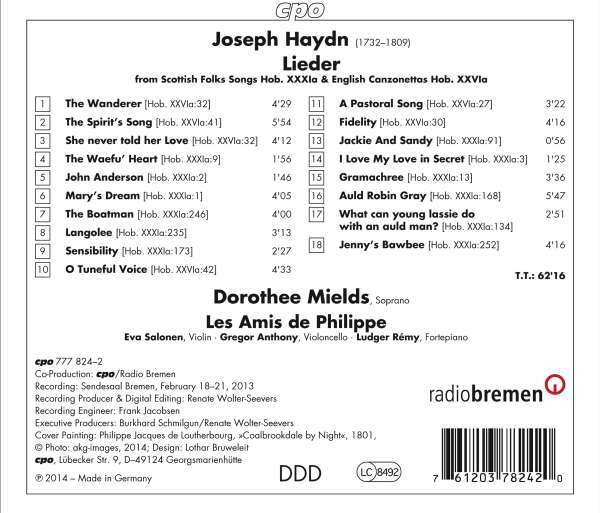 Der Artikel Joseph Haydn (1732-1809): Schottische Lieder & Englische Canzonetten wurde in den Warenkorb gelegt. Dorothee Mields is one of the leading female vocalists in the field of the music of the seventeenth and eighteenth centuries and is especially loved by the public and press for her unique timbre and moving interpretations. She is thus also for us a fortunate and perfect choice for the interpretation of the Scottish songs and English canzonettas of Joseph Haydn. Her flawless technique and her voice's ethereal clarity mean that she knows exactly how one should sing these songs and relate the stories behind them, thus endowing them with new life. The ensemble Les Amis de Philippe assists her with great tonal sensitivity. 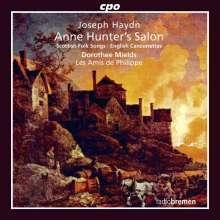 Between 1791 and 1805 Haydn wrote arrangements for 426 Scottish songs in response to commissions from Scottish publishers and did so in the belief that he was writing folk music; in reality, however, it was cultivated salon music with a »message character.« The songs sold very well: catchy melodies penned by a star composer – that went over very well with the British. And there's more: »Haydn invested all his experience and his talent in these arrangements, which one perhaps might term the last love of his composer's life« (Andreas Friesenhagen). Symphonie Nr.4 op.51 "Alla Turca"